The mighty dollar’s persistent strength is the biggest story of the day. The greenback’s broad based gains can be attributed entirely to the upward drift in Treasury yields and President Trump’s promise of lower corporate taxes. Paul Ryan got the market excited this morning when he said their goal is for tax reform to become law by the end of the year. The Trump Administration had many setbacks but this is one area where the President should receive widespread Republican support because it is the party’s best hope for a major legislative accomplishment before next year’s midterm elections. According to the House Ways & Means Chairman Brady, more details on their tax reform plans will be released on September 25th. So far, the market has been skeptical because the plan has been vague and while its still unclear how much progress has been made, setting a specific date to share more information gives investors hope which can go a long way. It helped investors shrug off the softer than expected producer price report that showed inflation growth rising less than expected in the month of August. Tomorrow’s consumer price report should be stronger with Hurricane Harvey driving up gas prices last month. However today’s move has taken the dollar to important resistance levels versus euro and yen that would be a perfect place for a profit taking or corrections. Technically, today’s rally in USD/JPY stopped right at the 50-day SMA and 2nd standard deviation Bollinger Band. 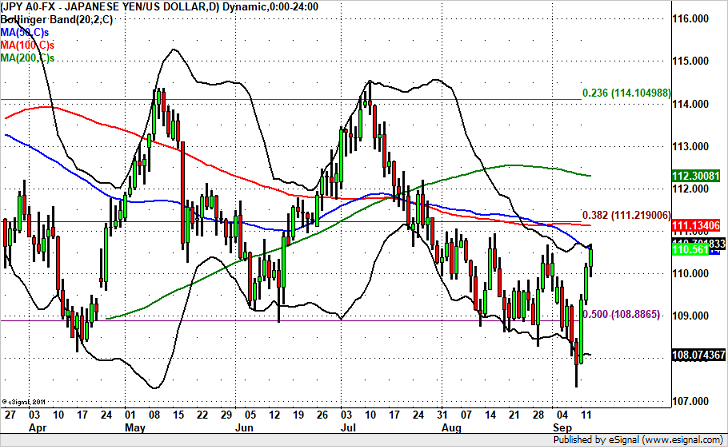 So it either fails here or hits the 100-day SMA / 38.2% Fib retracement of the June to December rally near 111.15. Either way, there’s significant resistance above current levels. If USD/JPY pulls back, it should find initial support at 110.